At Monza, on April 18, 1982 a Rondeau M382 won the very first World Sportscar Championship race run under the Group C regulations. This was very much an interim car based on the French manufacturer's earlier GTP cars. A month later, at Silverstone, the first Rondeau purpose built for the Group C regulations broke cover. Dubbed the M482, it was created with the help of aerodynamicist Max Sardou. His involvement was crucial to the project as sophisticated 'ground effect' aerodynamics would become a key part in the design of all Group C cars. The Frenchman was one of the ground effect pioneers and had already helped design the Lola T600 GTP racer a year earlier. For the M482, Sardou devised massive underbody tunnels, which ran on either side of the cockpit and engine. Together with the large venturis in the tail, the tunnels helped accelerate the air flow under the car, creating a low pressure area, which literally sucked the car to the ground. The tail itself swooped downwards and featured fins on which the rear wing was mounted. Underneath the carbon-fibre composite with Nomex sandwich body panels, the M482 featured an all-new aluminium monocoque that used the Cosworth DFL engine as a fully stressed members. To allow for a clean airflow through the tunnels, the rear suspension was mounted in-board with the springs and dampers actuated by rockers. Entered alongside the interim M382s, the first M482 had a disastrous debut. It qualified a lowly 27th and was eventually forced to retire with bodywork and suspension failures caused by vibrations of the engine and the huge loads generated by the ground effect body. The issues proved difficult to sort at short notice and Rondeau decided to rely on the M382s for the remainder of the year. For the 1983 season, Rondeau received funding only for the 24 Hours of Le Mans where Ford of France backed a three-car effort. The M482s lined up in 16th, 19th and 20th position but were all forced to retire with engine related issues. 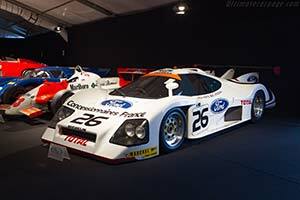 The cars were sold on to privateers and one continued to race at Le Mans through to 1987 when it finished 12th overall. The M482 was the end of the line for the brief but successful spell for Rondeau as a manufacturer. With the likes of Porsche, Lancia and Jaguar entering the Group C ranks, there no longer was a place for a privateer like Jean Rondeau at the highest level of sports car racing.